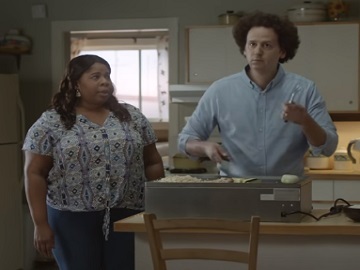 GEICO advertises its homeowners and condo insurance in a new commercial, featuring actor Josh Sussman as a husband who starts hibachi grilling in his apartment to reduce the stress of buying a new home. “You still stressed about buying our first house, sweetie?” his wife (played by Chevinne Hughes) asks him at the beginning of the 30-second spot. He confirms, saying he thought doing some hibachi grilling would help take his mind off it all. The woman suggests he could relieve some stress by calling GEICO for help with their homeowners insurance. “GEICO helps with homeowners insurance?” he asks a little bit surprised while showing off some hibachi grilling moves that end up with a fire that turns on the fire alarm. Grabbing an umbrella and holding it above her head, his wife says GEICO could save them a bundle of money too, which makes the guy want to call GEICO right away. He asks her to hand him the cell phone, but doesn’t stop handling his utensils. Instead, he’s trying to hold the phone with them. The commercial ends with the voiceover urging viewers to “Get to know GEICO and see how much you could save on homeowners and condo insurance”. Sussman, best known for his role as Hugh Normous in Wizards of Waverly Place and his role as Jacob Ben Israel in Glee, is one of the many actors that appeared in ads for GEICO. To promote its services, the insurance company has also enlisted, over the time, Daniel Roebuck, Darren Richardson, Max Lloyd-Jones, David Ebert, David Anthony Hinton, Jack Plotnick, Daniele O’Loughlin, Christopher Chen, Casey Campbell, Steve Talley, and more.